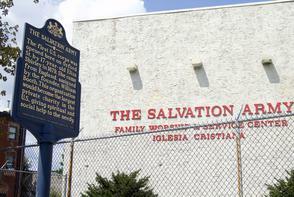 This is the site of the first U. S. Corps of the Salvation Army, founded here in 1879 by 17-year old Englishwoman Eliza Shirley. The building had previously been a temporary hospital during the Civil War, a stable, and a chair factory. 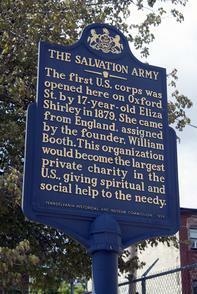 William Booth founded the Salvation Army in London in1865, and Shirley joined the London mission when she was sixteen. When Shirley's father, a silk weaver, moved to Philadelphia to ply his trade, Eliza and her mother stayed behind to continue their work with the Army. They soon joined him in Philadelphia, and Eliza was determined to bring the Army's work with her. 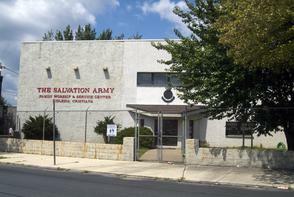 She founded the first American branch of Salvation Army here, and today the organization has 16 corps in Philadelphia alone and runs numerous social programs. The bilingual (English and Spanish) signage on the façade of this building reflects the organization's adaptation to the local Latino population.